Joe Astolfi has been a weather enthusiast and geography guru ever since childhood. After earning an Associate degree at Terra State Community College in Ohio, he decided to pursue a Bachelor degree in meteorology at Northern Illinois University. He minored in Geographic Information Systems (GIS). 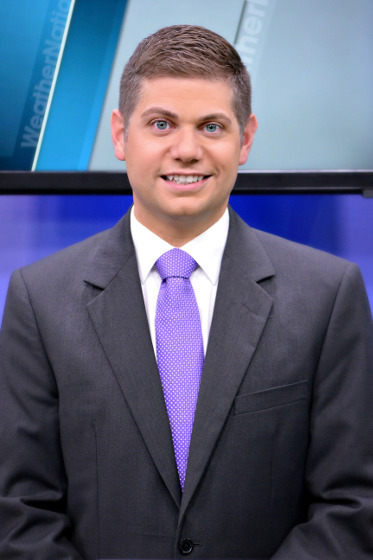 Before arriving at WeatherNation TV, Joe worked at WREX-TV in Rockford, Illinois. Forecasting for northern Illinois and southern Wisconsin was anything but ordinary. Severe storms, tornadoes, flooding, blizzards, and heat waves are just some of the extreme weather events he has covered. Joe grew up in Sandusky, Ohio and will always have a passion for the Great Lakes region and all it has to offer. When I was young, I would flip through nearly all the local newscasts and make sure to catch all of the different weather reports. I'd even call the local weather hotline several times a day (just ask my mom about her phone bill)! Since I was always 'weather-aware' I decided that I should help spread that message to others. What better way than as an on-air meteorologist?! There are many events that stand out. Most recent is the devastating November 2013 tornado outbreak. I remember tracking those deadly storms as they raced across Illinois, Kentucky, Indiana, and Ohio. Worrying about the safety of my extended family while trying to forecast was quite the challenge. This event is proof that severe weather can happen at anytime of year. I love being outdoors, going on hikes, taking the back roads, and enjoying some beautiful scenery. I am an amateur photographer and love to capture nature at its finest. Visiting my family and friends are high on my priority list as well! I would say that I have many influential people in my life. Professionally speaking, my colleagues, both past and present, have helped me grow as a meteorologist. Everyone brings something different to the table; with all that knowledge and experience collaborating, only good things can result.